As I mentioned recently, I am collaborating in a joint series of articles in Spanish language which try to explore the expansion of Homo sapiens from the double viewpoint of archaeology and population genetics. The series, hosted by Noticias de Prehistoria – Prehistoria al Día, began this past Thursday with David Sánchez’ article on the African MSA, earliest fossils of H. sapiens and other early African cultures like the Lupemban and Aterian. In the next week I plan to explore the genetic aspects, in line with what has been published in this blog and its predecessor Leherensuge. It’s possible that it’s not totally complete (feel free to add to our unavoidably limited knowledge) but it does gather in a quick view most of the African Middle Paleolithic (MSA, Aterian and Lupemban). The site of Katanda which has a special interest because of the harpoons, the earliest known ever, was absent in the version first uploaded but this has been corrected now. This synthetic map, together with the extensive bibliography (in several languages) that David links at the bottom of his article are, I believe, an interesting reference for all those interested in the origins of Homo sapiens and its first prehistory in the African continent. Most readers are probably at least somewhat familiar with the many, often impressive and revealing, South African sites but, besides the already mentioned Katanda harpoons, what really impressed me a lot was the finding in Sibudu, Northern Mozambique, near Lake Malawi, of fragments of ancient fossilized mattresses made up of vegetation that has bug-repealing properties (→ news article at El Mundo[es]). Apparently the owners, some 73,000 years ago, burnt them now and then in order to destroy parasites. Since c. 58,000 BP the number of mattresses, fires and ashes grew, surely indicating greater population densities, at least locally. The ancient inhabitants of that area of Mozambique are also known to have milled and processed, some 100,000 years ago, a diverse array of plants, including sorghum, “African potato” (medicinal), wine palm, false banana, pigeon peas, etc. Contrary to some rumors and some skepticism, the archaeology and radiocarbon chronology appear to support only Neanderthals as the material authors of the first “mode 4” stone industry of Western Europe: the Châtelperronian. They still allow for it, and especially the novel behavior of production and use of durable ornaments (on bone mostly), to have been influenced by the penetration of Homo sapiens. association of Neanderthal remains, CP assemblages, and body ornaments. CP skeleton from Saint-Césaire (France). from modern to Neandertal groups. Fig. 1. Calibrated ages and boundaries calculated by using OxCal 4.1 (37) and IntCal09 (36). The Grotte du Renne ages are in black and are compared with the Saint-Césaire human [Neanderthal] bone date in red. Asterisk indicates anthropogenically modified bones. The results are linked with the (NGRIP) δ18O climate record. 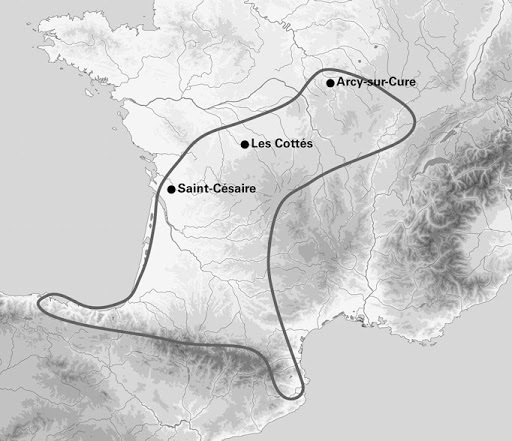 Importantly, it is also confirmed that Grotte-du-Renne (Arcy-sur-Cure, Burgundy) is one of the last Chatelperronian, and therefore surely Neanderthal, pockets in Western Europe, co-existing with Aurignacian North-East and South-West of it, what is suggestive of this latter culture, probably the first settlement by Homo sapiens, expanding to SW Europe via Italy rather than Germany. Finally, according to our results, the CP Neandertals of the Grotte du Renne, Saint-Césaire, and Les Cottés clearly postdate the earliest likely modern humans remains documented in western Europe (43) and largely overlap in time with the early Aurignacian in the Swabian area (44) and in southwestern France (42). Fig. S1. Geographical distribution of the Châtelperronian assemblages and location of the three main Châtelperronian sites discussed in the text. Hat tip to Linear Population Model. Source: Atlas of Human Anatomy. I wonder how much this confusion between frontal squama (rising of the forehead) and browridge (facepalm!) has caused the strange theories of Trinkaus and followers? The controversial construction of the Three Gorges Dam served at least to make some extensive and intensive archaeological research in the area, evidencing human presence in much of the last million years. The contributions of the Chinese Paleolithic record to broader ranging paleoanthropological debates have long been difficult to decipher. The primary problem that hinders many contributions that include or focus on the Chinese record is that relatively few regions outside of the main flagship sites/basins (e.g., Zhoukoudian, Nihewan Basin, Bose Basin) have been intensively researched. Fortunately, systematic archaeological survey and excavations in the Three Gorges region, South China over the past two decades has led to the discovery of a number of important hominin fossils and Paleolithic stone artifact assemblages that have contributed to rethinking of ideas about hominin adaptations in Pleistocene China. This paper provides a detailed review of the results of recent paleoanthropological, particularly Paleolithic archaeological, research from this region. The Three Gorges region is located in the transitional zone between the upper and middle reaches of the Yangtze River (Changjiang River). Vertebrate paleontological studies indicate that the faunas from this region belong primarily to the AiluropodaeStegodon faunal complex, a group of taxa representative of a subtropical forest environment. Systematic field surveys identified sixteen Paleolithic sites in caves and along the fluvial terraces of the Yangtze River. Based on geomorphology, biostratigraphy, and geochronology studies, these sites were formed during the Middle to Late Pleistocene. Follow up excavations at these sites led to the discovery of a large number of Paleolithic stone artifacts, Pleistocene mammal fossils, as well as some hominin fossils. Analysis of these materials has provided the opportunity to reconstruct hominin technological and mobility patterning in a restricted spatial point. The Paleolithic technology from the Three Gorges region is essentially an Oldowan-like industry (i.e., Mode 1 core and flake technologies) comprised of casual cores, whole flakes, fragments, and chunks as well as a low percentage of retouched pieces. The utilized stone raw material is primarily high sphericity cobbles and limestone, which were locally available along the ancient river bed and surrounding terraces. Most of the artifacts are fairly large in size. All flaking is by direct hard hammer in a single direction without core preparation. Unifacial choppers are the predominant core category, with fewer bifacial choppers, sporadic discoids, polyhedrons, and bifaces. The flake types demonstrate that the first stage of core reduction is represented by a low percentage of Type III and VI flakes. Some flakes are retouched unifacially by direct hard hammer percussion on the dorsal surface of the blanks. Archaic Homo sapiens and modern H. sapiens identified from some of the cave deposits are likely the hominins responsible for the production of the stone artifacts. Implications for Oldowan-like technological patterning in South China are discussed. Xinlong cave (Wushan Co., c. 118-154 Ka): Four hominin permanent teeth were recovered during the 2001 excavation field season (Fig. 2). These hominin fossils have been tentatively assigned to archaic H. sapiens, though more detailed morphometric analysis is warranted. Migong cave (Wushan Co., c. 13,100 BP): The hominin fossils are two fragments of parietal bones which belong to one individual (Fig. 2) and can be assigned to modern H. sapiens. An archaic jaw bone was also found in the 1950s without context. It is not clear if by archaic Homo sapiens the authors mean Homo sapiens with debatable archaic features or, using obsolete terminology, other species of Homo such as Homo erectus. I’m guessing that the latter but no idea. Considering the recent experimental discovery of Green et al that present-day non-Africans have 1 to of their nuclear DNA of Neanderthal origin, we propose here a model which is able to quantify the genetic interbreeding between two subpopulations with equal fitness, living in the same geographic region. The model consists of a solvable system of deterministic ordinary differential equations containing as a stochastic ingredient a realization of the neutral Wright-Fisher process. By simulating the stochastic part of the model we are able to apply it to the interbreeding ofthe African ancestors of Eurasians and Middle Eastern Neanderthal subpopulations and estimate the only parameter of the model, which is the number of individuals per generation exchanged between subpopulations. Our results indicate that the amount of Neanderthal DNA in living non-Africans can be explained with maximum probability by the exchange of a single pair of individuals between the subpopulations at each 77 generations, but larger exchange frequencies are also allowed with sizeable probability. The results are compatible with a long coexistence time of 130,000 years, a total interbreeding population of order 10⁴ individuals, and with all living humans being descendants of Africans both for mitochondrial DNA and Y chromosome. The decision of which model correctly describes the origin of Homo sapiens is obscured by the intricacies of the statistical methods proposed for evaluating the models themselves. And so they proceed to create their own intricate model and even more intricate interpretation. Sincerely, their model of continuous admixture would normally cause West Eurasians (at least) to have much more Neanderthal introgression than Papuans, whose ancestors have been far away from West Eurasia (the former Neanderlands) since c. 80 Ka most probably (archaeological evidence of African-related techno-cultures in India, Petraglia 2007), while West Eurasian ancestors would have been in intense contact with Neanderthals all or most of that time until the effective Neanderthal extinction of c. 35,000 years ago. There’s no convoluted model nor mathematical fallacy that can circumvent that: anything but a single admixture episode or process early on in the colonization of Eurasia by Homo sapiens makes no sense. Signals of archaic admixture have been identified through comparisons of the draft Neanderthal and Denisova genomes with those of living humans. Studies of individual loci contributing to these genome-wide average signals are required for characterization of the introgression process and investigation of whether archaic variants conferred an adaptive advantage to the ancestors of contemporary human populations. However, no definitive case of adaptive introgression has yet been described. Here we provide a DNA sequence analysis of the innate immune gene STAT2 and show that a haplotype carried by many Eurasians (but not sub-Saharan Africans) has a sequence that closely matches that of the Neanderthal STAT2. This haplotype, referred to as N, was discovered through a resequencing survey of the entire coding region of STAT2 in a global sample of 90 individuals. Analyses of publicly available complete genome sequence data show that haplotype N shares a recent common ancestor with the Neanderthal sequence (∼80 thousand years ago) and is found throughout Eurasia at an average frequency of ∼5%. 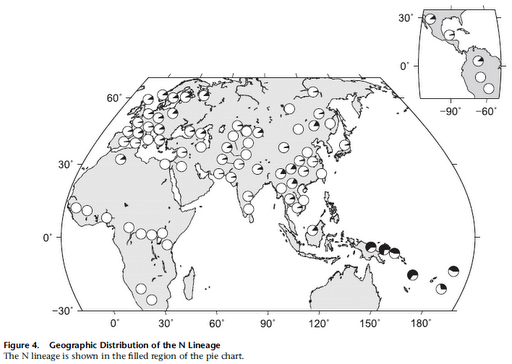 Interestingly, N is found in Melanesian populations at ∼10-fold higher frequency (∼54%) than in Eurasian populations. A neutrality test that controls for demography rejects the hypothesis that a variant of N rose to high frequency in Melanesia by genetic drift alone. Although we are not able to pinpoint the precise target of positive selection, we identify nonsynonymous mutations in ERBB3, ESYT1, and STAT2—all of which are part of the same 250 kb introgressive haplotype—as good candidates. According to Wikipedia, STAT2 is a gene which offers immunity against adenoviruses, which are related to respiratory illnesses (common cold, pneumonia, bronchitis…) and some other common diseases like conjunctivitis or gastroenteritis. Most infections are mild and require no specific treatment. This suggests me that the selective pressure was quite weak, if any at all, so its introgression is most likely the product of a fluke and not selection. However it is not totally impossible that in the past some viral strain was particularly deadly causing adaptive selection. 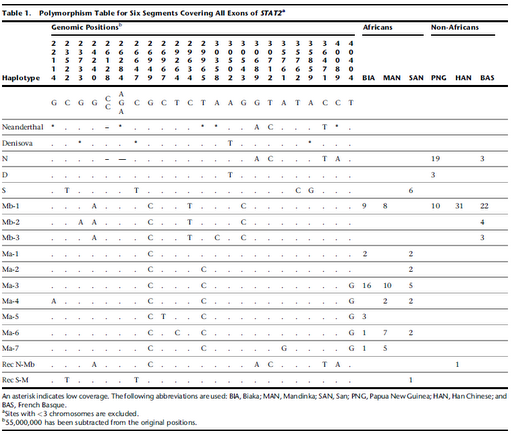 I can only imagine (as I have not got access to the paper, so I can’t double check) that the introgressed haplotype includes the first two SNPs in their T variants (see below). If so, the Neanderthal allele should cause: increased risk of osteopenia in women, some increase in the likelihood of lymphoma, among other things (arthritis, asthma?) which I’m not sure about. I do not see any indication of the haplotype being beneficial in any way but you tell me. We can see in them that the genomic positions at 55,030,689, 55,030,712 and 55,036,471 do not seem to correspond with the SNPs listed in SNPedia (so my previous inference was wrong, it seems). We can also see in the map how the haplotype N is distributed in what would seem to be random founder effects. There is a chance that the Denisova variant (haplotype D) is found in some Papuans but being described by just a single transition this is not certain. As you know I dislike molecular-clock-o-logy, which I consider close to pseudoscience but considering that there has been some paper recently claiming (as they usually do: as if it was rocket science instead of a mere educated guess) low divergence ages for Neanderthals and H. sapiens, I feel almost obliged to mention that this paper estimates the haplotype divergence at some 500-731 Ka., what, after correcting for the usual under-estimate of the Pan-Homo divergence, can be consistent with the classical archaeological understanding of the Neanderthal-Sapiens divergence before a million years ago, with the spread of Acheulean and H. heidelbergensis.